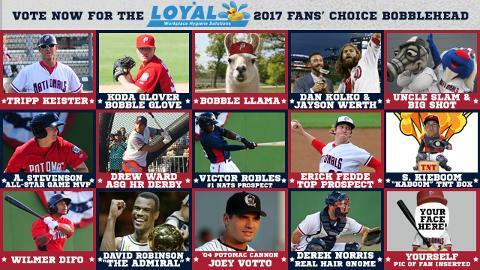 We are proud to again sponsor the Potomac Nationals Fan’s Choice Bobblehead Give-Away! After weeks of fan submissions, the P-Nats have narrowed the field down to 15 proposals. Vote on these finalists by Jan. 27 to have a say in which one will get made into a bobblehead! Click here to vote (poll is on the right). Voting ends on Friday, January 27th. The winning fan who has his or her P-Nats bobblehead idea brought to life will receive four reserved tickets to the August 26th game courtesy of the Potomac Nationals and of course, their very own P-Nats Loyal Hygiene Solutions Fans’ Choice Bobblehead. Note: If the same idea was submitted multiple times, it was credited to the first person who submitted it.